Ryan's Guitars: New Guitar!! Gibson Les Paul - 2006 '57 Goldtop Reissue! New Guitar!! 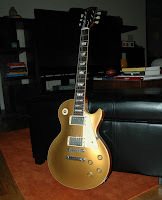 Gibson Les Paul - 2006 '57 Goldtop Reissue! This guitar is as lovely to play as my '59, but it does have a slightly different tone. I find it to be a lot brighter and more aggressive sounding. The R9, in comparison, has a much rounder tone that seems to be better balanced between the high and low frequencies. I love that they have such a distinct tonal difference, because it would be pointless to own two guitars that sound too much alike, in my opinion. 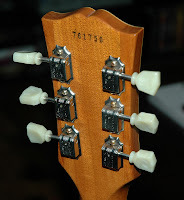 The neck carve is also slightly different (not on purpose, but just due to the different building techniques of the luthiers). I love the way the guitar feels! It is a toss up between the R9 and this one in terms of playing feel, but I still lean towards the R9 in the tone department. As is fairly common on most Custom Shop Gibson models, you'll find sloppy workmanship on the bridge saddle slots (amongst other places). On this one the bridge saddles were particularly bad, and I ended up needing to practically re-radius the whole bridge! The ABR-1 bridges are built with the 12" radius curvature of the fretboard already, but you also have to take into account the varying thicknesses of the strings themselves. Unless the saddles are notched deep enough for the heavier strings to sink down into saddle properly, they will sit too high and the string radius will be thrown out of whack. I just file a high saddle slot down a tad bit, tune back up and test string height with a depth gauge ruler on the 12th fret, file some more if needed... then follow up with some 1200 grit sandpaper to make sure the slot is as smooth as silk. Pretty easy stuff! I am really pleased with both of my Les Pauls, so far. My only real complaint about them are the pickup covers. The covers on these guitars are not properly installed by Gibson, in my opinion. For any song that has enough gain and a loud amp these pickups will feedback, and not in a good way. I'll likely be forced to remove the covers at some point to avoid this, but I really hate the idea since it ruins the look and changes the sound of the guitars. Time will tell, but I am afraid the covers will have to eventually come off.